This is my new hero - she's 12 and her name is Lauren. What she's holding up there is her Dream Board full of things she wants to do, earn, be, have invest in and go to in life. Lauren's fabulous parents were constructing their Dream Boards when Lauren decided off her own back to head to her room and start clipping and searching and planning for her own future. She was so enthusiastic that her board was the first one completed in their house. It's an awesome example of someone not content to life drift by them, someone who wants to reach out and create the life she wants. Just goes to show you you're never too young to start dreaming, planning and working towards your goals. Now if she's 12 and is already a rock star at this - what's stopping you? Dream boards come in many different forms - and are a fantastic way to keep the bigger picture in focus. When I started my busines, I printed out 4 photo on a big sheet of paper, and stuck it to the door of my built in robe. Picture 1 was a shiny BMW M3, picture 2 was a convertible Ferrari, pictur 3 was a villa in Thailand, picture 4 was a bodybuilder. I've lost count on the number of days these photos have motivated me .. I do love a dream board! Good luck with achieving number 4!! I am not sure if you will read this comment but I will write it anyway. My name is Lauren and I am the person that you wrote this post about 3 years ago. I would just like to say that I still have that email sent to my mum containing the article about me, intact I am sitting here looking at it now, it is pinned up on my pin board, which is where it has been for the past 3 years. One, that I do want to create the life I want, when i was twelve I only understood just the basics of something like this and now that I am a lot older I understand a whole lot more about life and I know know that I definitely want to create my own life. Two, to work hard for things and I know that this dream board showed me that if I set my mind too things I can achieve it and although I have long taken my dream board down of my wall it is still there, tucked away in my cupboard, away from viewing eyes and I still look at it from time to time just to remind myself to keep going and to never give up trying for something I want whether it may be a material thing like a pair of skis, a holiday or a long term thing like a job. I would just like to share with you some of my accomplishments off of my dreamboard, although I have not completed all of my dreams on there and I may not complete all of them as some of them are no longer a dream of mine, I did complete the wants that I really did want to achieve. One: I wanted to earn my very own pair of skis. I achieved this one two years ago when I finally managed to conquer my fears and go outside of the wake on skis, I did this and once I did do that I became unstoppable. I went on to learn to slalom ski and am now hoping to get my own slalom ski as a result of this. To me this showed to me that I can do something if I set my mind to it and if anyone out there is worried because they might fall along the way, you just have to learn to get back up, brush yourself off and try again, exactly like i did when learning to go outside of the wake. If I fell off, I just got back up, put my skis back on and tried again! You can achieve anything you want to if you just try. I can tell you that I have received many a+'s in school since then and I continue to receive to this very day. Three: I had on my dream board that I wanted to become an architect and a chef. Well as you get older and I'm sure everyone knows this, you change your mind. So when I was was 12 my dream was to become an architect and a chef but I have since changed that and I am now working towards becoming a lawyer. I am only in grade nine at the moment and my mind will probably change again but that is what it is right now. The last thing on my dreamboard that I am going to tell you about is that I wanted to receive a medal in hockey. I have just finished my fourth year in hockey as the season just ended. 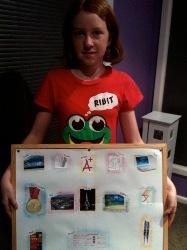 On my dreamboard I did have a gold medal but the medal that I received was a lot better than a gold medal and I am proud of myself for getting it. It wasn't a best and fairest or a most goal scorer or anything like that. It was a medal for the coaches award, it isn't a gold medal and it certainly dosent have the Olympic emblem on it but it shows to me that I can do it. I am only as good as what think I am, I just did my best and by doing that I was rewarded and I am happy that I did because that just encouraged me to try harder and I did try harder because this year i got most goal scorer award and that s something I never thought I would get but I did and that is cause I believed in myself, I believed that I could do it and I did. Thank you for writing that article about me in 2010, it has shown me what a great person I can be and I hope it showed other people that they can achieve things f they set their minds it it as well. So - #1 of course I read my comments. #2 - it seems you're still my hero - you've brought tears to my eyes reading what you wrote! #4 - I also want to send you a book, so email me and let me know your postal address.